Want to improve the overall test coverage of your assembled boards? It’s easy. 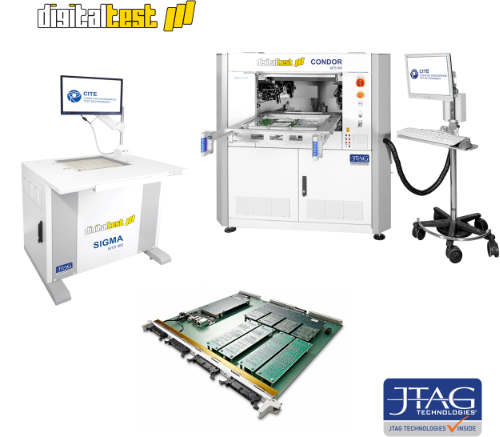 Simply combine your JTAG Technologies boundary-scan tools with your existing automatic test equipment (ATE). 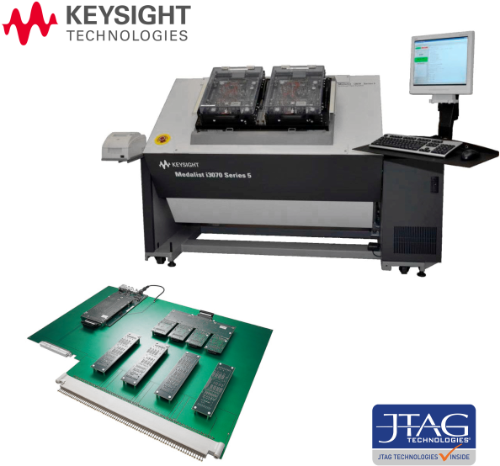 We work with any vendor of in-circuit testers (ICT), flying probes (FPT) or functional testers (FT). 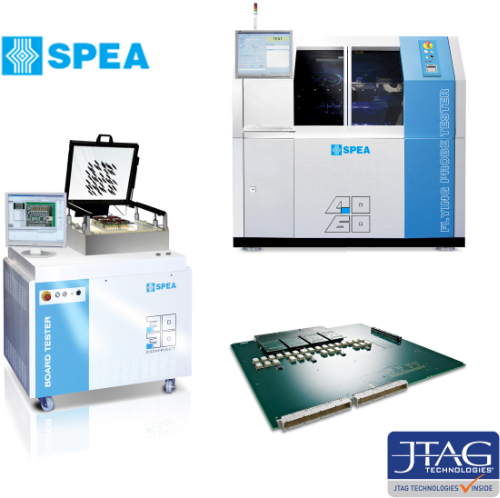 In co-operation with the engineers of SPEA Spa, Italy, JTAG Technologies developed a bespoke version of our JT 2147 QuadPod that fits perfectly in to the instrumentation chassis of SPEA’s 3030 in-circuit tester. This JT 2147/SAM connects the TAP signals via our standard JT 3727/TSI controller and fixture to the UUT. For the 4040 flying probe tester integration, a standard JT 2147 pod is used. To simplify test development a data-package exported from SPEA’s Leonardo software includes all test point information and allows rapid application generation from within JTAG Technologies ProVision software. During application debug/validation ProVision can even take control of the probes to speed-up this process.. Digital signals can be driven via boundary-scan and sensed with the I/O pins or flying probes of the SPEA machine and the other way around. Results and diagnostics are presented in the Leonardo run-time GUI. Users wishing to integrate JTAG Technologies boundary-scan applications with Teradyne teststations and GR228x have two options. 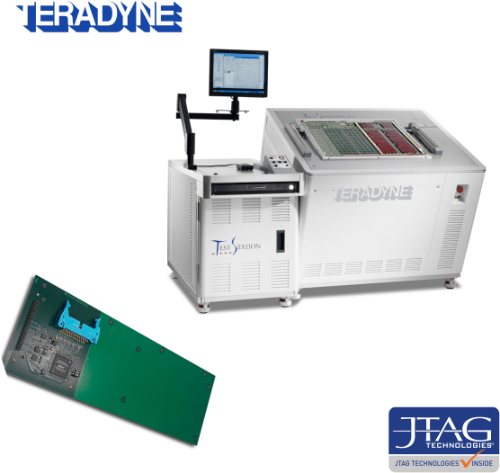 The first uses Teradyne’s own Deep Serial Memory (DSM) card as the boundary-scan interface/controller while the other solution is based on our standard JT 37×7 controller whih may be combined with a dedicated version of our QuadPod called the JT 2147/CFM. The DSM based solution allows you to mix stimulus and response via ICT pins/nails with boundary-scan driving and sensing capabilities to access nodes on your target. 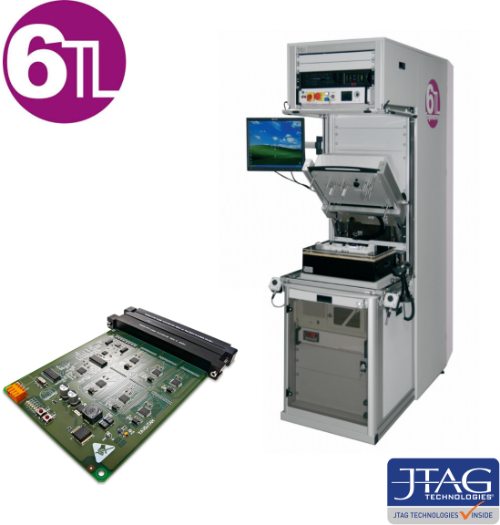 The JT 37×7 based solution is more suited to applications requiring fast Flash or PLD programming via boundary-scan access. Both solutions are controlled by the Teradyne GUI and reports with full pin level diagnostics are fed back into the Teradyne report generator. Our ProVision development tools can be used to generate the boundary-scan based test patterns which are provided to the Teradyne test development tools for further processing. Symphony AP is the result of teamwork between JTAG Technologies and the engineers from Huntron. The Symphony AP package is a combination of our standard QuadPod plus a JT 37×7/TSI controller, ProVision Platform and BSD diagnostics software. This package lets you combine probe access provided by Huntron’s roving prober and boundary-scan access in one test. ProVision also controls the placement of the probe. 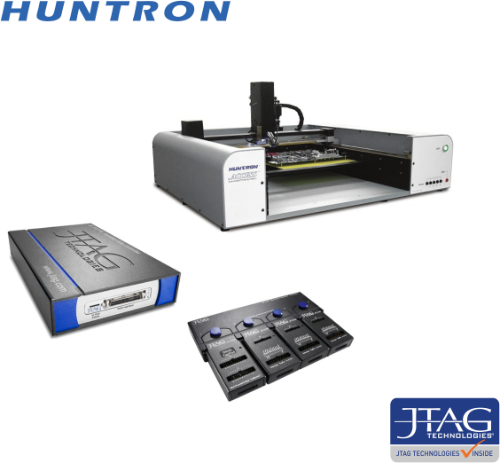 Combining the analog signature analysis (I-V trace) capability of the Huntron system with boundary-scan creates an excellent mixed signal tester platform. 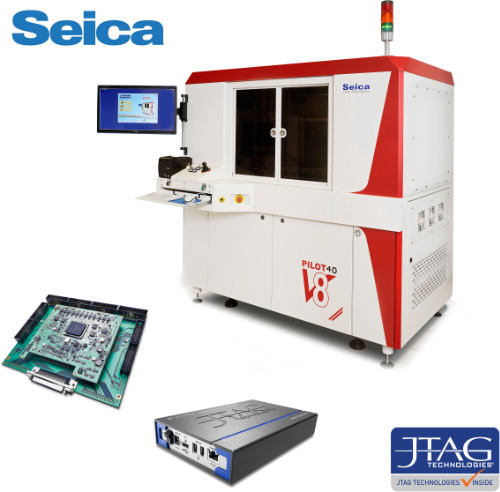 JTAG Technologies has a long-standing partnership with Seica Spa, Italy with whom we developed one of the earliest flying-probe and boundary-scan test integrations. 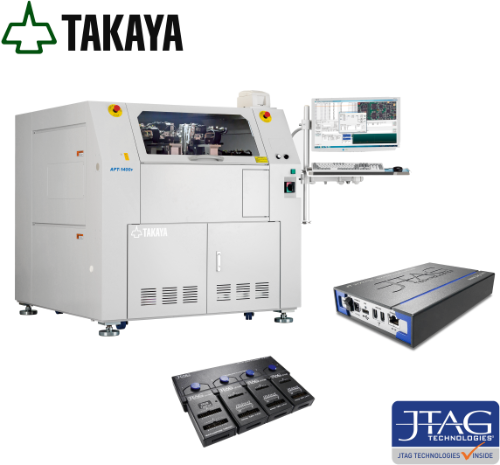 JTAG Technologies Symphony Pilot system utilises standard JT 37×7 DataBlaster hardware to allow test and in-system programming applications to be executed and diagnosed on a full range of Seica test platforms. Through our close working relationship with the engineers of DigitalTest GmbH in Germany, a dedicated version of our JT 3727 DataBlaster controller has been developed that fits perfectly into the DigitalTest MTS testers. This JT 3727/DPC boundary-scan controller connects the TAP signals via the tester’s fixture/interface directly to your target. In addition an enhanced version of our execution software has been developed that allows synchronised interaction with the pin cards of the MTS tester and its GUI software (CITE32). Digital signals can be driven via boundary-scan and sensed with the I/O pins of the MTS machine or the other way around. Results and diagnostics are presented in the CITE32 GUI. During the validation of the developed test applications, JTAG ProVision can also control the MTS tester. Test and in-system programming applications are generated on JTAG Technologies’ development tools (JTAG ProVision or Classic) and can be easily imported into the 6TL environment. The Symphony 3070 product is a combination of dedicated hardware based on JTAG Technologies’ DataBlaster technology (JT 37×7/APC) and software that allows you to execute boundary-scan applications developed with our ProVision tools on your 3070 tester – both Unix and Windows operating systems are supported. Results and diagnostic reports are presented in the Keysight/Agilent GUI. The bundled solution of our JT 37×7/APC controller, execution software and diagnostics software is sold via JTAG Technologies as Symphony 3070/APC-x7/PC or as Symphony 3070/APC-x7/Unix. Together with the engineers of Viavi Solutions we developed an Viavi dedicated version of our QuadPod that fits perfectly in to a 42xx tester. This JT 2147/AGP connects the standard JT 37×7 controller (PCI or TSI) via your fixture to your target. In addition an enhanced version of our execution software has been developed that interacts with the pin cards of the Viavi and its GUI. Digital signals can be driven via boundary-scan and sensed with the I/O pins of the Viavi machine or the other way around. Results and diagnostics are presented in the Viavi environment. 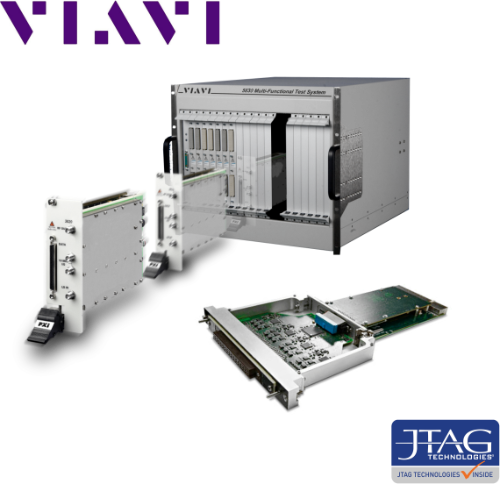 The bundled solution of a JT 37×7, JT 2147/AGP, boundary-scan execution software, diagnostics and an MTL controller code layer is exclusively sold via Viavi. For more information visit the Viavi website.